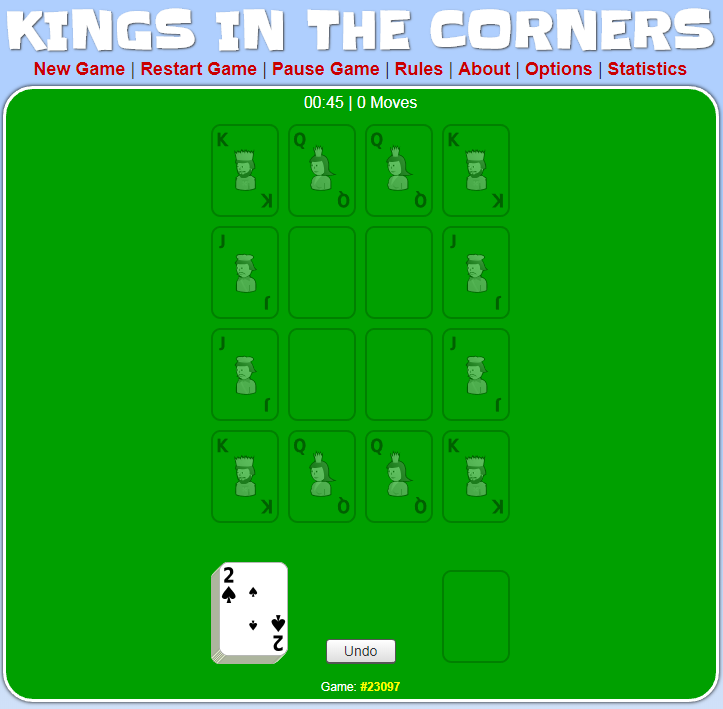 Kings in the Corner, also widely known as Kings Corners, is a multi-player card game. This is very similar to solitaire but brings in a twist make it more exciting. During a Kings in the Corner game, it feels like everyone is playing a single solitaire game but with the twist that there is only one winner. There are 4 piles at the beginning and 4 more in the corners can be started off with a king – thus the name of this game. Only things you need to indulge in this amazing game are one 52-card deck together with a supply of chips or pennies (Source). A playing set for the Kings in the Corner card game is being published by Jax Ltd. of Minneapolis since 1996. The actual card game was thought up in the 1910s by the “Grey Family aboard the SS Suevic”, says a current entry in Wikipedia. The gameplay of Kings in the Corner is quite simple. The dealer shuffles the deck of cards and deals 7 cards to every player. The remaining deck of the cards is kept in the middle on the playing board. Now, the topmost 4 cards from the deck are kept on the 4 sides of the deck like in North, East, South, and West directions, creating 4 foundation piles. All of these cards are kept face up. A card is drawn from the pile by the first player. The player places that particular card or any other card from his/her hand on the playing board. More than one card can be placed by the player at a time. The 4 face-up cards are considered as a beginning point while placing the cards from the player’s hand. A player places the cards in alternate colors and in descending order. For instance, if the beginning point card is 7 of spades, the player will place 6 of diamonds or hearts on it if he/she has the card on hand. Then the player creates combinations from the available cards in his/her hands and attempts to discard as many cards he/she can. If the current player cannot play any more cards, the turn is passed to the player on his/her left. If a king is drawn by any player, it is placed in an open corner. Then, it should be utilized as the beginning point as well. The game continues this way until a player discards all the cards in his/her hand and that particular player wins the game. If you manage to play all the cards available in your hand, you win. Else, after you have played any card you wish to or can, you have to draw one card from the stock and it ends your turn. You can watch a useful gameplay video at the official website of JAX Games. If you want to play online, check out cardgames.io. 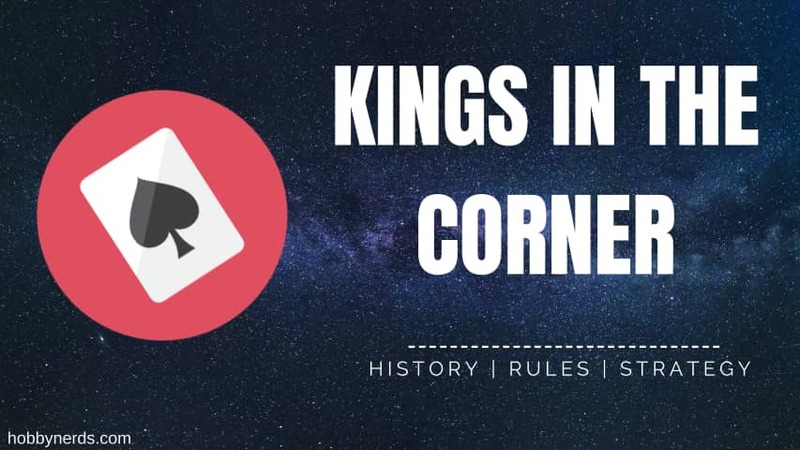 Here is a quick overview of the rules of Kings in the Corner card game. Ideal for 2 to 4 players. The first dealer is selected at random and after each hand, the turn to deal passes clockwise. If the center deck runs out of cards, the game continues without drawing. Point-wise, kings are considered the highest and aces are considered the lowest. A player is not allowed to hold any card back intentionally if it fits the playing board. In this version of Kings in the Corner, only two people can participate. Every time a king’s corner gets filled with an entire series from King-to-Ace, the participant who completes it gets a point for a “coronation”. Also, the player who first gets rid of his/her cards receives one point (Slaying the Dragon), but this player then continues playing by refilling his/her hand. The game keeps on continuing until all the cards have been used. Hence, in every game, there will be 5 points scored: 4 coronations and 1 dragon slain. The player with a majority of points wins – 3 points to 2 is a normal victory, 4 points to 1 is an incredible victory, and 5 points to 0 is an absolute victory. Each player gets penalty points for the cards left in his/her hands at the end of the play. Cost of a king is 10 points and all the other cards cost 1 point each. These points get accumulated until a player exceeds or reaches a target score agreed in advance (for example, 25 or 50). The player who holds the lowest number of penalty points at the specified target becomes the winner. These moves are considered valid in Kings in the Corner. You can literally play a “King in the Corner”. Kings are the only cards that you can play in the corner spaces formed by the cross. Once a king is played, cards may be laid off that pile by the players like any other foundation pile. You can move a complete foundation pile onto another pile, as long as the move creates a valid sequence. This becomes possible when the cards are dealt first. You can play a card on a foundation pile on the cross. For this, the card played has to be of the opposite color of the foundation card and immediately below its rank. Any card or sequence of cards can be played on a vacated foundation pile. Variations to Kings in the Corner add extra rules or scoring regulations. In one method, a tableau is used that consists of 16 cards, presented in a 4-by-4 grid. When playing this version, players may only advance kings to the corners while queens can only be advanced to the left and right center tableaux, and jacks only to the top and bottom center tableaux. The remaining tableaux is then filled by the players, removing pairs of cards with an accumulated value of 10 with the aim of freeing up the tableaux for extra cards, trying to play the whole deck without running out of room.